Dynamic Effort Training: BS or Legit? I have a good topic of the week post for you today. Let me catch you up to speed. *Disclaimer – this article applies more so to powerlifters seeking strength gains (increased powerlifting totals), not so much athletes seeking gains in explosive power, though the data can be used to guide training either way. Dynamic effort doesn’t improve technique as it involves a different motor pattern compared to maximal training. Mike also mentions that he believes that dynamic effort training can improve performance via increased training frequency and hypertrophy, but still urges lifters to move away from dynamic effort work and begin using heavier loads on all training days. In case you didn’t know, Louie Simmons from Westside Barbell Club popularized dynamic effort training based mostly on Russian texts including the work of Zatsiorsky. Yesterday, Tom Barry from Westside Barbell Club (Louie Simmons’ intern) provided a rebuttal HERE. As you can see in the comments section, emotions run pretty high on this topic. Rather than take sides, I’d like to present some research to help clarify some points of contention in this debate. In Physics, we know that F = MA. With maximal loads, M is at it’s heaviest, but A is very small. With submaximal loads, M is lighter, but A can be faster. Let’s say a strong 275 pound powerlifter can squat 1,000 pounds, bench 800 pounds, or pull 900 pounds. Since acceleration would be nil during these maximal lifts, we can estimate the force by multiplying the mass of the lifter and the barbell (in kilograms) by gravity (which is 9.8 m/s^2). We could also just perform the lifts on a force plate which shows the vertical ground reaction forces (Newton’s laws state that for every action there is an equal and opposite reaction). So this powerlifter squats a system-load of 1,275 pounds (body mass plus barbell mass) which comes to 578 kgs, which comes to 5,668 Newtons (578kgs x 9.8m/s^2). The theory is that the lifter could use submaximal training to create just as much force by increasing acceleration. Let’s say the powerlifter used 600 pounds (60% of his 1RM), he could theoretically accelerate the load rapidly and therefore create the same 5,668 Newtons of force. In The Science and Practice of Strength Training, Zatsiorsky uses a graph (see below) showing that maximum muscle force takes approximately four tenths of a second (.4 sec) to achieve (he mentions that this varies according to the lifter, with some taking .3 sec and others taking .5 sec). It’s worth mentioning that the graph and data wasn’t cited, so there’s no reference to check (though I don’t doubt Vlad’s data). 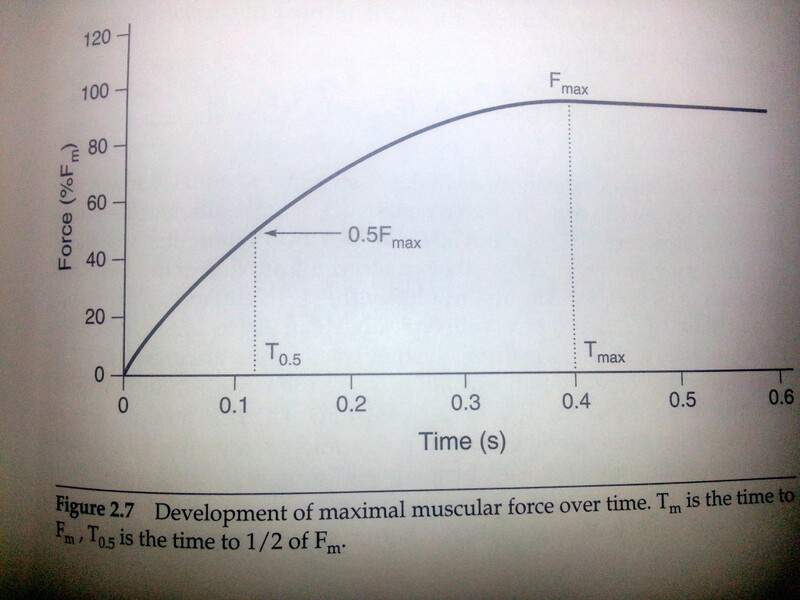 Based on this premise, it does not take much time for the muscles to produce maximum force. 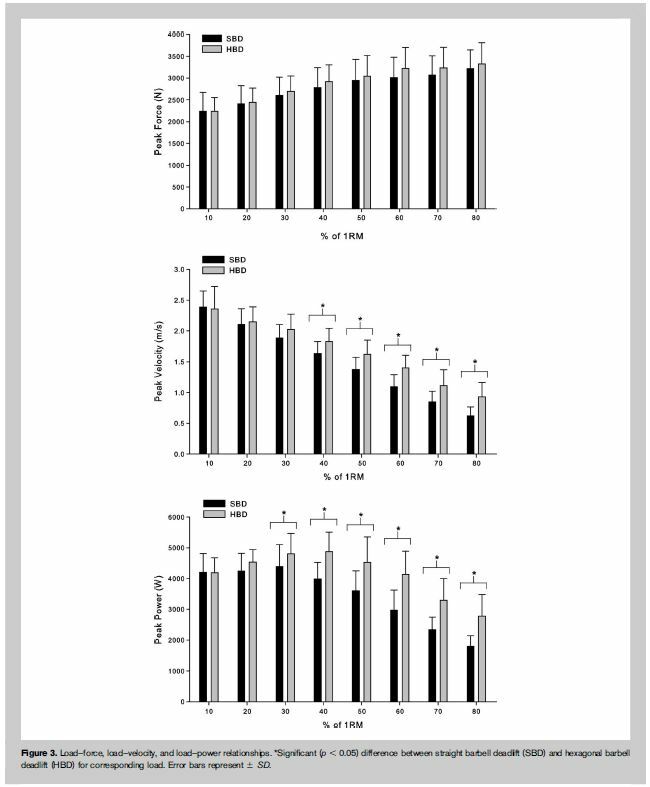 Sure, it shows that the muscles don’t have time to produce max force during sprinting or drop jumping, but it does imply that the muscles have sufficient time to produce max force during a dynamic effort lift (i.e. speed squat, speed bench, speed deadlift). For comparison purposes, ground contact times during sprinting can reach as low as .07 seconds at maximum speed (Tyson Gay in THIS paper), whereas maximum power lift grinders can easily last 5 seconds (Benedikt Magnusson’s WR deadlift appears to last 3 seconds, Donnie Thompson’s WR squat appears to last 7 seconds, and Ryan Kennelly’s WR bench appears to last 8 seconds), one study by Escamilla showed that max deadlifts took a around 4 seconds to complete. Kawamori et al. 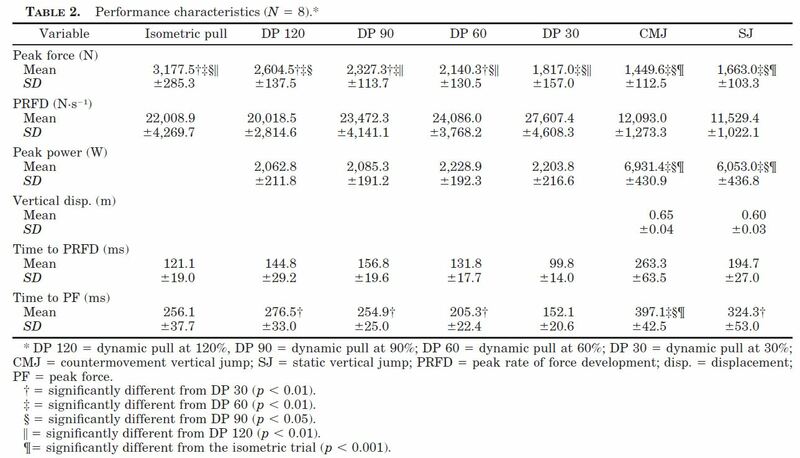 published a study seven years ago titled Peak force and rate of force development during isometric and dynamic mid-thigh clean pulls performed at various intensities which included a detailed chart of the peak force and peak rate of force development data for isometric and dynamic mid-thigh pulls (sort of like a rack pull but the knees are more involved). As you can see, it only takes the muscles .256 seconds to produce peak force during isometric mid-thigh pulls, and with dynamic pulls it takes .277 seconds, .255 seconds, .205 seconds, and .152 seconds to produce peak force with loads corresponding to 120%, 90%, 60%, and 30% of 1RM power clean loads, respectively. What’s interesting is that peak force is reached more quickly during all mid-thigh pull variations compared to static and countermovement jumps, which took .324 seconds and .397 seconds, respectively. There are a few more things worthy of mention in this study. Peak force was maximized during the isometric mid-thigh pull, peak rate of force development was maximized during the dynamic mid-thigh pull with 30% of 1RM power clean load, and peak power was maximized during the countermovement jump. Swinton et al. published an excellent study two years ago titled A biomechanical analysis of straight and hexagonal barbell deadlifts using submaximal loads which included a detailed chart of the load-force, load-velocity, and load-power relationships. Subjects were 19 males powerlifters with an average body weight of 252 pounds and an average max deadlift of 538 pounds. Whether this research applies to top powerlifters especially those well-versed in dynamic effort training remains to be seen, but for now this is what we have to go by. There are some interesting things we can see here. First, it appears that maximum force indeed cannot be reached with the dynamic effort method. Force creeps higher and higher as loads increase, indicating that the increases in acceleration with dynamic effort training cannot compensate for the reductions in mass. Second, velocity decreases as loads increase (duh! ), but this is important because velocity decreases by a greater factor than force, leading to my next point. Third, since power equals force times velocity (P = FV), you can see that the product that leads to the highest power outputs is 30-40% of 1RM loading. Therefore, if using dynamic effort training during the deadlift for the purpose of maximizing power output, then loads of 30-40% of 1RM should be utilized. Here is a chart showing pros and cons of various loads and methods. Some of it is factual, while some of it is highly speculative. Everyone knows that maximal effort (maxing out) is critical for powerlifting success. However, as to which method should be used to increase training frequency – the dynamic effort method, or simply lifting heavier with normal temp but staying away from maximal loads or going to failure – is up for debate. I hope you enjoyed the article! And if you like this sort of thing, consider subscribing to our Strength & Conditioning Research Review where you can receive scientific information on strength training like this every month. Based on the above material, what sayeth you? Is dynamic effort the bomb, or could lifters see even better results going with heavier loads? The post Dynamic Effort Training: BS or Legit? appeared first on Bret Contreras.